You have probably guessed by now that I am taking a little break from sharing Christmas Cards with you. I have plenty to share but thought it would still be a good idea to share the everyday cards we still need. Today’s card has been created using the Share What You Love Suite. Oh, how I love this Suite. 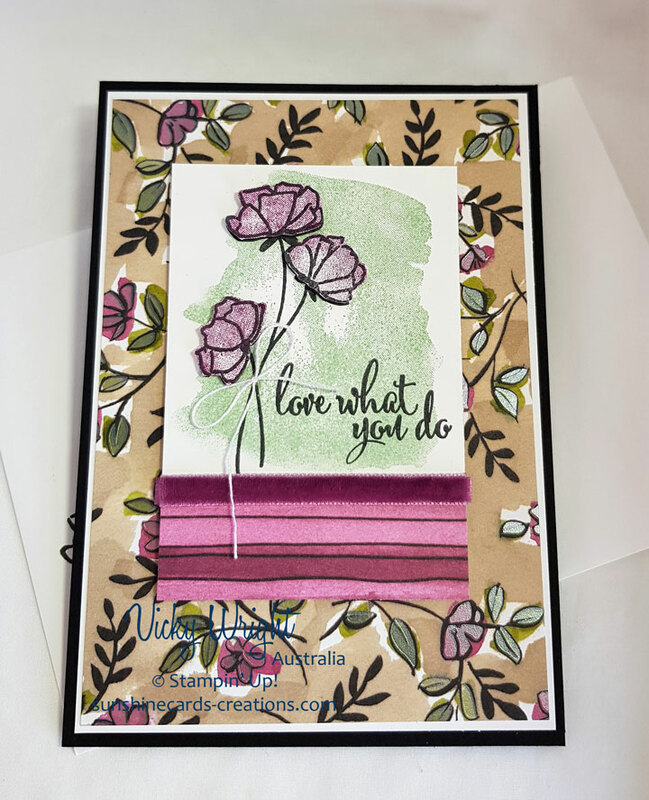 I’ve used the gorgeous Share What You Love Specialty DSP, the Love What You Do Stamp Set, the Pearlized Doilies & the Share What You Love Embellishment Kit. 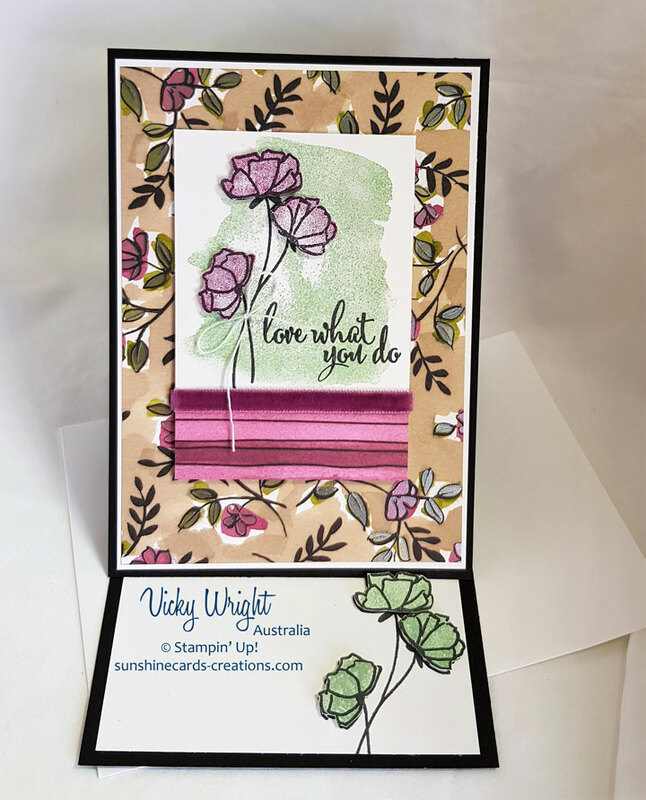 If you would like to create more cards using this Suite, click on the DSP Card Kits & Tutorials Page where you are able to purchased 3 tutorials using this Suite. Thank you for joining me today where once again I am part of the RemARKably Created Blog Hop which is open to all Remarkable Stampers and members of the Remarkably Created Training Centre. This month it is All That’s new in the new Catalogue. So much to chose from. Thank you so much Janet for making this possible. To keep it simple, I decided to go with a card we created in our Colouring Classes last week using the Varied Vases Stamp Set. I teamed it up with a little of the gorgeous Share What You Love Speciality DSP. The vases have been stamped direct onto Shimmery White Cardstock with Crumb Cake before being coloured & blended with a Blender Pen. To grab your free tutorial, please click on the link below which is above the photo of the card. In case you get lost on the hop, there is a list below the card that you are able to click on to follow along. Please leave comments to any that you may visit as I’m sure they would appreciate it. Thank you for visiting my blog today. Once again I am one of the lucky ones who gets to hop along with Kylie & 10 other lucky Demos. Thank you so much to everyone who voted for me. It was & always is very much appreciated. This was my card from the original May Blog Hop. Our theme is “Encouragement” where we specially make a card to someone that we think needs it right now. My card is one for an aunt who is going through a bit of a rough patch at the moment. I sometimes create cards for Mandy, pack & post them off every so often. She must really appreciates it as I will often receive a phone call saying how “tickled pink” she was when she opened them. If you click on the link above the card, you will be able to download your free tutorial to create your own card. It includes a list of products used, measurements (metric & imperial) plus the instructions. This Friday sees the DSP Card Kits & Tutorials go live. With only just over a week left to take advantage of the “Share What You Love” Suite, this bundle is perfect to start off our DSP Card Kits. The product will be available in the new Catalogue, but not as a Bundle. Already I have had lots of enquiries wanting to reserve their kits so as not to miss out. Happily I have done so which makes it easier for future numbers & ensuring I have extras for everyone else. Thank you so much for your support! There have been a few slight chances to the kit so please be sure to read all the information pertaining to the kits. Not sure how it will work? On the last Friday of each month, a new kit featuring a Bundle or Suite from the Annual, Holiday or Occasions Catalogues will be released & available for purchase. The Cards Kits will be limited, although the PDF Tutorials will be available anytime. Two weeks prior to the release of the Kit, you will be advised of the upcoming Kit, ie the Bundle or Suite, inks, Cardstock plus any extras that you may need to create your cards. This is so that you are able to order your items to create with your kit. If you order the items from me, then of course, your Kit will be FREE. Extras required to create your cards are posted at the bottom of the page. YES, SU! Demonstrators may use the tutorials for their classes. Just one big thing to remember – once these items are gone, they are gone, with the exception of the Share What You Love Suite Early Release. Don’t forget to shop for your Last-Chance Products too. Once they are gone, they are gone forever.